Home canning and preserving is growing in popularity every day. It's easy and a great way to get the most from your backyard garden or farmer's market finds so that you can enjoy seasonal bounty all year long. 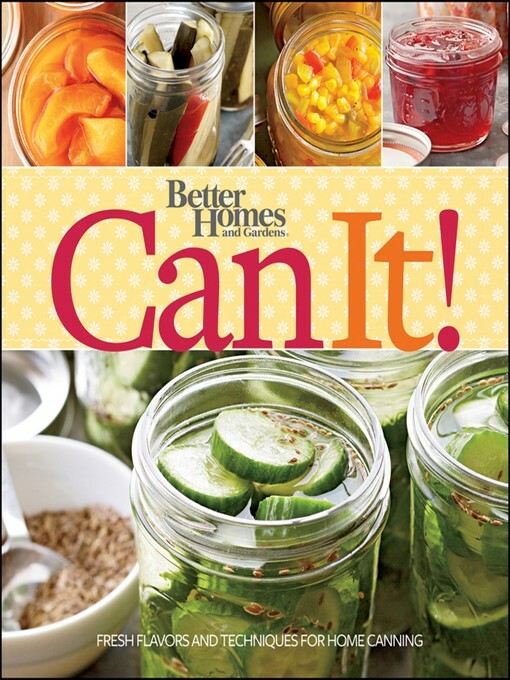 This follow-up to Better Homes and Gardens You Can Can, gives you fresh, new flavor ideas and combinations to spice up your canning and preserving. Better Homes and Gardens Can It! brings canning and preserving to a whole new level, perfect for new canners looking for contemporary ideas as well as experienced canners wanting to expand their recipes. Full of delicious recipes and hands-on instruction, as well as gorgeous photography, this is the book you want to add new excitement to canning fruits and vegetables! For today's growing number of do-it-yourselfers and home cooks who embrace the benefits in-season produce, Better Homes and Gardens Can It! is the source for fresh, new canning and preserving ideas.